Along with such names as Sylvia Peters and Humphrey Lestoq, Richard Hearne has a place in British TV history. Born to a theatrical family in Norwich, in 1908, Hearne took to the boards at the age of 6 months in his actress mother's arms. The play was called For The Sake Of A Child and the child was Richard Hearne. His early showbiz career was as an acrobat in the travelling circus but soon found that comedy embellishments earned more popularity than ordinary tumbling, much in the way that in later years, Tommy Cooper found more fame and endearment as a comedian rather than a conjuror. He began his movie career in 1934, appearing with Syd Crossley (replaced by Oliver Hardy in Duck Soup) in Give Her A Ring, a romantic comedy based in a telephone exchange. Two more films followed before WW2. He developed a much-loved comedy act for the stage. As was normal at the time, this involved considerable travelling and in 1936, when the Baird television system was being tested at London's Alexandra Palace, Hearne was a willing volunteer. He agreed to appear in a cookery programme (nothing changes) called Take Two Eggs. A movie version of this footage was released by the BBC in 1939. Hearne and seasoned comedy actor Fred Emney started working together and in 1936 developed a routine called Big Boy. Hearne played an upper-class bumbling anti-hero in a creative style he called "refined slapstick". He named that character Mr. Pastry and his future was assured. Meanwhile - in 1937 - the BBC had begun regular broadcasts and Hearne was one of the first performers to be signed and certainly the first comedy performer to have his own show, simply called Mr. Pastry. New series were produced right up to 1961. But one of his most celebrated routines - The Lancers - was not original to him at all. It was a one-player mime comedy based on a popular dance, with imaginary partners. 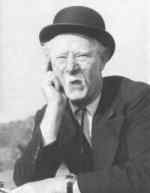 It was the original idea of comedian Tom D. Newell, who had worked with Harry Lauder and Wee Georgie Wood. Tom's widow gave Hearne permission to take over the routine and Hearne founded his career on it as Mr. Pastry. The act's popularity spread far and wide and resulted in Mr. Pastry being interviewed on the Ed. Sullivan show in the USA. The BBC television series was magic for young and old alike. Knockabout humour, with a hint of satire; the notion of the "upper class twit" would have been impertinent in those days, but certainly inspired at least some elements of Monty Python in later years. For Hearne, Mr. Pastry had taken over. All his (many) film roles after that were as Mr. Pastry, and when offered the part of Dr. Who as a replacement for Jon Pertwee he insisted on being Mr. Pastry and was rejected. Hearne and Pertwee had worked together in several productions in earlier years, and indeed Pertwee had appeared in the Mr. Pastry TV series. Hearne was also offered several Shakesperian roles, but again insisted on being Mr. Pastry, however unrealistic, and again rejected. For a time in the 1950s he tried to escape his alter-ego with a new character called Billy McQuirtle, but Mr. Pastry was here to stay. There are few showbiz characters who were genuinely beloved in their time, legends afterwards and remembered as great people, but Richard Hearne OBE was one of that kind. His charity work and armed forces entertainments were kept private and largely unknown until his death in 1979. He kept a nation laughing throughout some of the most difficult times in British history and his films and shows live on. albeit in black and white. A truly remarkable and unforgettable giant of the world of entertainment. I remember my two sisters and I used to look forward to Mr Pastry on TV but I can't remember much about the show. I'm just getting old I s'pose.